We may never know the grocery shopping habits of superheroes, we can definitively prove that they text! A lot! To hilarious results. 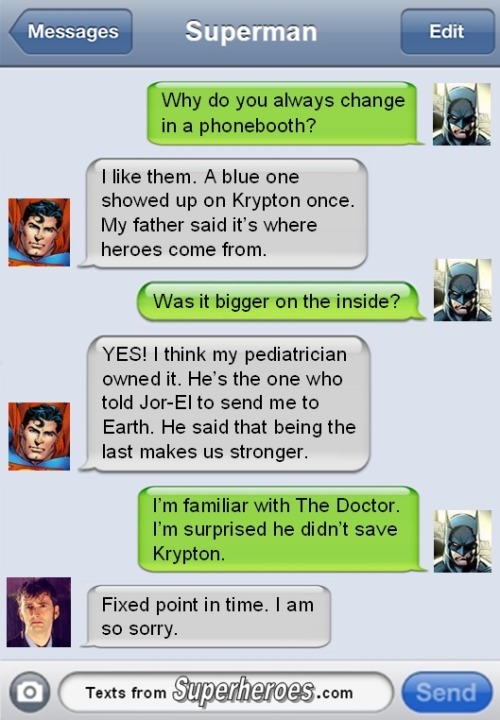 May I have the honor of introducing you to your favorite new website; Texts From Superheroes. What makes it so awesome? I am glad you asked! It's true that there are many tumblrs and websites devoted to superheroes and the zany things they do when they aren't out saving the world. Texts From Superheroes is exceptionally funny and includes way more characters than just the normal Avengers or Justice League. Sure, Batman and Superman are being dicks to each other (as usual), but there's also Robin, Lois Lane and hilarious henchmen. The masterminds behind the texts are also geniuses with comedic timing and turn of phrase. Captain America can't get health insurance because his social security number is from 1919. Everyone makes fun of the Flash for using an iPhone. Thor doesn't understand how Black Friday works. There's even Deadpool! Everything is better with Deadpool. (Except that Wolverine movie. That was an abomination). Superheroes: They're just like us!